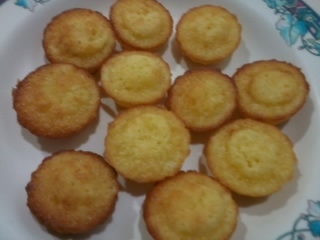 Somehow my baking mood could not stop and I had the mood to bake some mini butter orange cakes yesterday during dinner time. Yes, during dinner, after work. Hubby was cooking, and since dinner was not ready yet, I took the opportunity to whip up some mini butter orange cakes since I have a mandarin orange sitting in the fridge for a week already. I just mix and whisk everything in a bowl. Pre-heat oven for 10 minutes in advance at 170 degrees, grease baking pan, scoop batter into the pan and bake for 15 minutes or until fork comes out clean.